We are part of the Metallurgy Department, School of Engineering, Federal University of Rio Grande do Sul. We have in our staff four professors, thirty engineers and one technician who together with PhD students, Masters and undergraduates compose a team of approximately 200 people working in different areas of expertise. The choice of topics for research and services in general carried out within our Post-Graduation Program in Mining, Metallurgical and Materials Engineering (PPGE3M) has been directed in accordance with the expectations of our clients from the public and private sector which ensures a balance between practical and academic issues. We have a impressive infrastructure for the characterization of engineering materials, as well as performing mechanical tests in air and in corrosive media, process simulation via the finite elements method and non-destructive tests. LAMEF has implemented and accredited by General Coordination of Accreditation of Inmetro a quality system based on the International Standard ISO/IEC 17025:2005 (General requirements for the competence of testing and calibration laboratories) which aims to systematize the testing and provide reliability of our results. The paper "Innovative friction welding process for pipeline construction", in which the development of the MASF 1500 machine was outlined, received the prize for the best technical paper presented in oral format at the 13th COTEQ - Equipment Technology Conference. 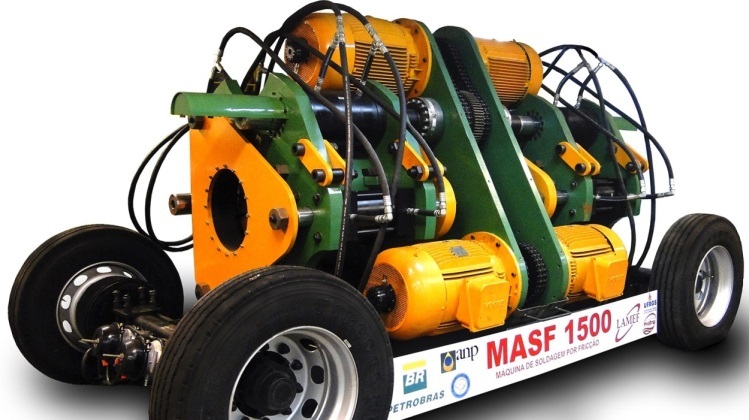 The project "Rotating ring friction welding machine" was selected as finalist of the 2015 ANP Award for Technological Innovation in Category 1 - Technical Innovation developed in Brazil by a Science and Technology Institution (ICT). Petrobras is LAMEF's partner in this project. The Physical Metallurgy Laboratory of the Federal University of Rio Grande do Sul (UFRGS) was the winner in category ICT (Science and Technology Institution). LAMEF has its own infrastructure and develops scientific projects and performs technological services in the area of engineering. The prize was awarded to the paper "Development of a Friction Welding Machine for Pipes with Rotatory Ring and Evaluation of Stainless Steel Duplex UNS32205 Pipe Weld Joint", presented by Daniela Ramminger Pissanti. The results presented were generated through research and development projects with Petrobras and ANP. 9º International Colloquium SAE BRASIL for suspension and road implements.